The cost of exclusions is currently spread across all local authority schools, depriving the general fund of 2.5 million. A plan to curb spiraling numbers of expulsions of Northamptonshire children may see each local authority school foot the £20,000 bill for their alternative education. 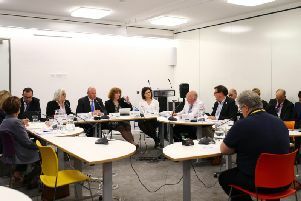 Northamptonshire County Council's proposal comes after the number of permanent exclusions across the county reached 150 last year. Twenty children were excluded from Northampton schools alone. By law these children must still be educated, and the money to pay for alternative provision currently comes from the general pot of funds for all schools at a cost of more than £2.5 milliion a year. The proposal means that only those schools who exclude pupils would have to contribute. They would pay £3,000 for the first two children but the full cost of £20,000 thereafter. A report to the Schools Forum says: "Permanently excluded pupils place additional financial pressures on the designated schools grant and impacts on educational attainment. "The local authority recognises that the majority of schools aim to be inclusive and work hard to include all pupils. However a number of schools are high excluders and this has a significant impact both on the pupils and high needs costs." Thirty-two children were excluded from county primary schools in 2017/2018 and 118 were excluded from secondary schools.